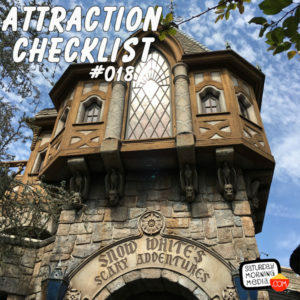 http://www.attractionchecklist.com – This episode we take a ride on one of Disneyland’s opening day attractions, Snow White’s Scary Adventures. Along for the ride is John B. deHaas! Ride Audio Recorded on June 21, 2016. This episode we are taking a ride on Snow White’s Scary Adventures at Disneyland. This dark ride is described in the guide map as follows: Hop inside a mine cart and follow the path of Snow White as she flees into the dark forest to avoid the wrath of the evil Queen. There is no height requirement for this attraction and the Thrill Level describes the ride as being Loud, Dark, Scary and a slow ride. 1. Snow White’s Scary adventures is an opening day attraction that began operation on July 17, 1955. Back then though, the ride was called Snow White’s Adventures. The ride got its new name in 1983. 2. Snow white didn’t actually appear in the ride until 1983 as well! When the ride opened in 1955, the imagineers had designed the ride to make it feel as if the guests themselves were Snow White going through the forest and avoiding the evil queen. Many guests questioned where Snow White was, so in 1983, the ride was changed to include snow white, though she only appears in the attraction once. 3. One of the signature effects of the attraction is the transformation of the evil queen into the old hag. This effect is achieved by haven two figures separated by a sheet of glass that is standing in for an actual mirror. 4. The ride vehicles for the attraction are each randomly named after one of the seven dwarves. 5. For years after the ride opened, guests were swiping one of the apples that the witch would hold out as they passed by. When the ride was revamped in 1983, an effect was created to make it seem as if the apple was there but if guests reach out for it, their hands go right through! Now, let’s visit Snow White and the Seven Dwarves on Snow White’s Scary Adventures. On the ride with me today is John B. deHaas and after we ride we’ll discuss our thoughts on this classic Disneyland attraction. If you have headphones, put them on now as we experience this binaural ride through of Snow White’s Scary Adventures. The date about the apple hologram is not accurate. I took a couple apples around 2001-2003.